A military wedding took place at the Wesleyan Church, Higham Ferrers, on Saturday, when Miss Alice Draper, younger daughter of Mr and Mrs Chas. Draper, of Westfields, Higham Ferrers, was married to Sergt. Horace Pendered (KOYLI), fourth son of Mr and Mrs J Pendered, of 82, Queen-street, Rushden. The bride, who was given away by her father, was fashionable costumed in navy blue, and she also wore a rose-coloured hat. She carried a choice bouquet of roses and lilies, the gift of the bridegroom. Two bridesmaids were in attendance, viz., Miss Frances Slough (niece of the bridegroom) and Miss Florrie Townshend (friend of the bride). Both were charmingly gowned in brown in crepe de chine, with hats to match. They carried bouquets of carnations, and wore gold brooches, the gifts of the bridegroom. The duties of best man were ably discharged by Pte C Whiteman, of the Training Reserve (friend of the bridegroom). Subsequent to the ceremony, a reception was held at the bride’s home. Sergt and Mrs Pendered were the recipients of numerous wedding gifts, including a copper kettle from the girls of the Closing department of the CWS, where the bride has been employed for some years. The bridegroom, prior to the war, was studying at Sheffield Training College. 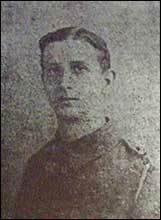 He enlisted in January 1915, and had been on the Western Front about eight months, when he received three wounds, during the great push on July 1st, viz, one in the head and two in the hip. He is now stationed at Brocton Camp, Staffs., where he is instructor in bayonet fighting.